After all what could be more British than a day trip to visit an ancient monument? Well lots of things really, but you know, this is the stuff we often imagine we like get off the sofa to go and do. 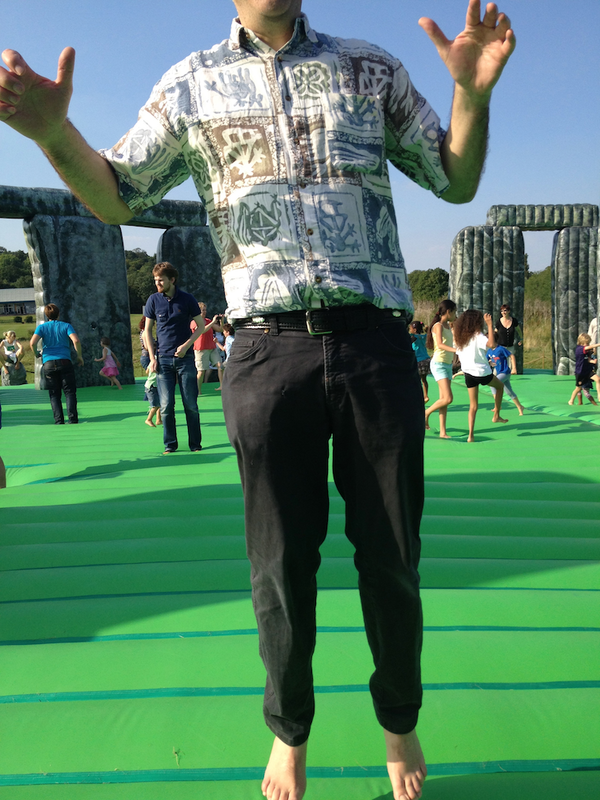 And Stonehenge is one of the country’s most recognisable sites, a prehistoric monument surrounded in myth and deemed a druid sacred place, so clearly fits the bill as a suitable place for a fun yet educational day out. But, you know, we have to take care of our cultural heritage so there’s a value in a replica in terms of protecting the original. In a way, it’s possible to read any number of cultural complexities into Sacrilege. Or you can just enjoy the bounce. There’s something very appealing about art that makes people behave as they usually wouldn’t in a public place and Sacrilege brings out the child in all of us. Silly it may be – though I reckon I could construct an argument that says it’s a powerful and important and above all very, very serious work of art if I set my mind to it (though for the avoidance of doubt I would like it known that I have no intention of doing so) – but it’s August and we all know that’s the silly season. 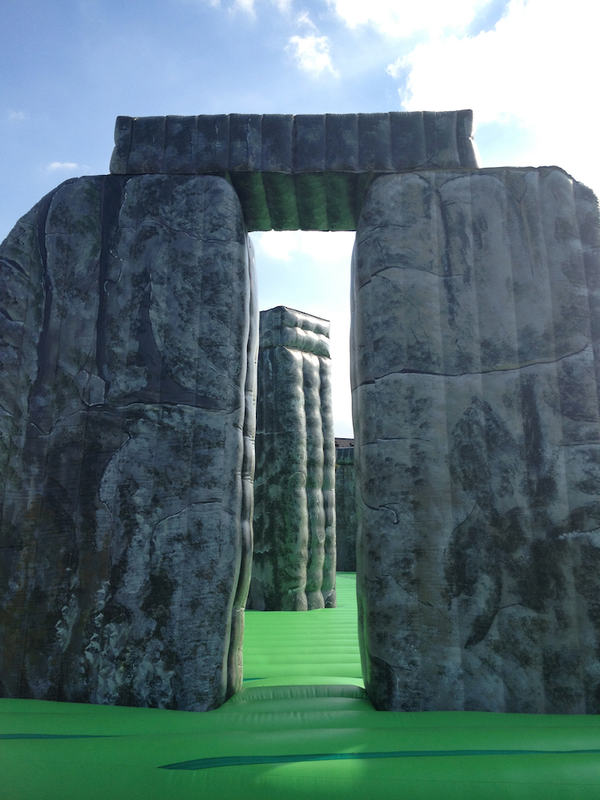 Sacrilege by Jeremy Deller was first installed in Glasgow as part of the Glasgow International Festival of Visual Art in April; it has been busily touring London parks during the Olympics as part of the London 2012 Festival and will continue to do so until Sunday 12 August 2012. After that it visits a few other places around the UK. Go and bounce. 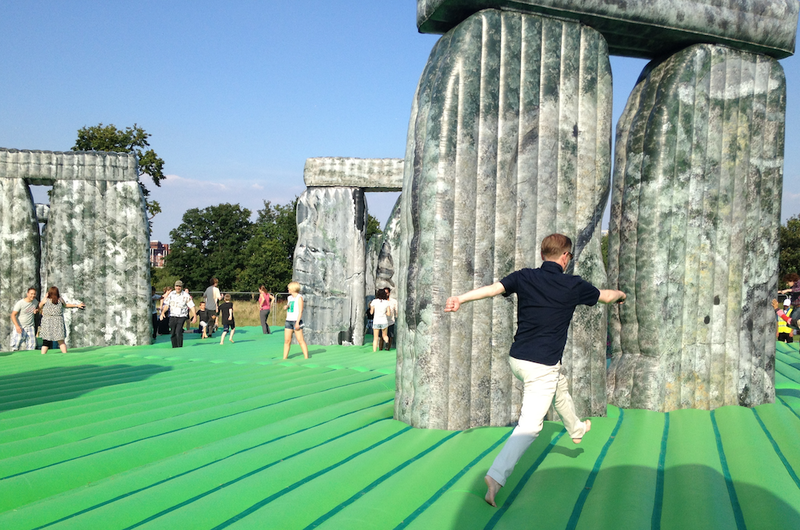 This entry was posted in Public Art, Sculpture and tagged art, bounce, bouncy castle, heritage, history, Jeremy Deller, London 2012, London 2012 Festival, play, Sacrilege, Stonehenge by Ann Jones. Bookmark the permalink.